The Content Marketing Institute recently released the fifth annual B2B Content Marketing Benchmarks, Budgets, and Trends – North America. This report is full of statistics and trends in content marketing. I’ve selected seven that I think are key for content marketing. Document your content marketing strategy. Only 35% of content marketers have a documented content marketing strategy. 60% of those who have a documented strategy, though, say their content marketing is highly effective. Only 32% of those with a verbal content marketing strategy would say their content is highly effective. The amount of content being created is growing immensely. 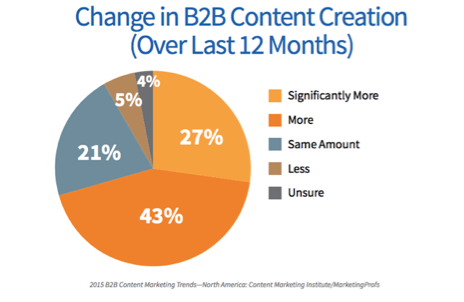 70% of marketers are creating more content than last year. With this growth, it is more important than ever to create content that breaks through the clutter and stands out. Look for new ways to engage your audience with your content. 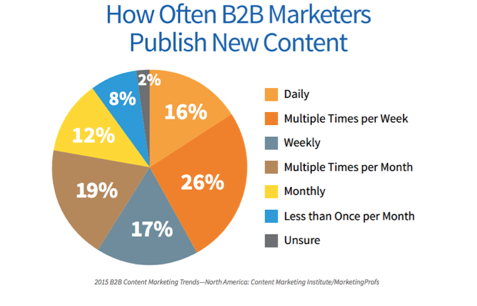 42% of content marketers say they publish new content daily or multiple times per week. 31% of “effective marketers,” though, publish new content multiple times per week and 32% of marketers with a documented content marketing strategy publish new content multiple times per week. Content is king, so make sure it’s informative and engaging and has a clear objective. Creating large numbers of meaningless content is not the goal here. 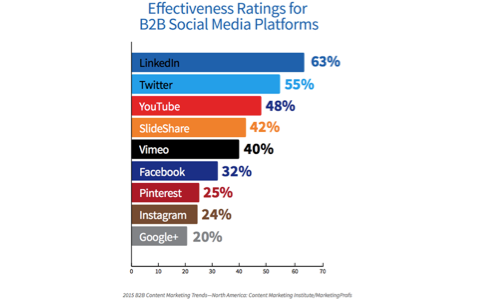 LinkedIn and Twitter top the most effective social media platforms. 63% of marketers rated LinkedIn as effective or very effective. (You know I’m a HUGE believer!) Twitter and YouTube came in second and third at 55% and 48% respectively. 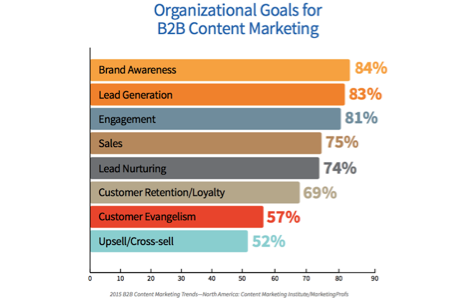 Brand awareness, lead generation, and engagement remain the top content marketing goals for marketers. 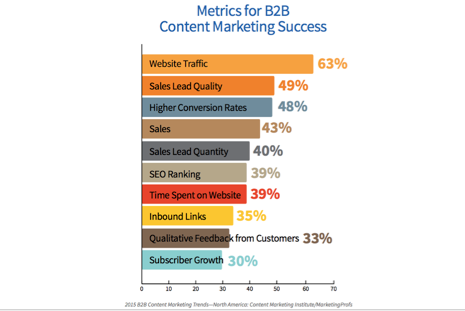 Website traffic still ranks as the most-used metric to assess content marketing success. Over 60% of marketers cite website traffic as their most important content marketing metric. Sales lead quality was second at 49%. 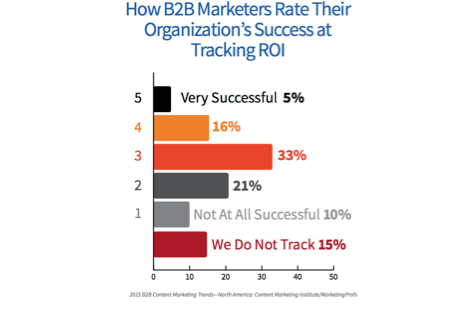 Only 21% of marketers are successful at tracking the ROI of their content marketing program. This means the majority of content marketers are not successfully tracking ROI. Only 35% of marketers with a documented content marketing strategy are even successful at tracking ROI. Clearly, the importance of content development and its role in driving leads cannot be understated. By developing a written content strategy along with proper execution and tracking, your efforts to drive leads, get found on search engines, and close sales are exponentially enhanced. According to a study by Experian, up to 90 percent of purchasers are influenced by online research. Clearly, the importance of your website cannot be understated. So, if your goal is to increase the conversion rate of the number of visitors to your website into more leads, profits, and revenue, then the following marketing approach is the right one for you! What is my site’s domain authority? Does Google and the other search engines see your site? Are your pages properly indexed and optimized? Domain authority helps indicate how well your site performs in a search engine. This tool provides your site with a score between 0-100. There are several online tools that will look at your site and provide you with this score. Let us know if you need help with this, and we will happily assist you with providing your site with its domain authority. Google Analytics provides you a tool that will show you where the traffic is coming from. Generally categorized as free and paid traffic, Google separates traffic by referral (coming from other sites), direct (paid traffic), organic (free search), and social (LinkedIn, Facebook, and Twitter). Google Analytics provides the number of visitors to your site. Calculating the number of net visitors is the number of visitors subtracted by the back rate or bounce rate. The back rate is the number of visitors who leave immediately after they visit the site. The bounce rate is the percentage of single-page sessions (i.e. sessions in which the person left your site from the entrance page without interacting with the page). Conversion rate represents the percentage of visitors who complete your desired action. That could be filling out a form, purchasing a product, or calling a telephone number. Simply, conversion rate is the number of conversions divided by the net number of visitors to your website. Establishing these benchmarks is important to setting goals that will help improve the performance of your website. And, the beauty of website performance improvement is that you can increase revenue without increasing advertising spend! Where is the traffic to my website coming from? What is the net traffic to my website? What is my site’s conversion rate? Ready to learn more? Download a FREE copy of the How To Improve Your Website For More Leads And Profits white paper today. Thinking About Starting A Business? Need A Strategy For Your Small Business Loan? BoeFly’s step-by-step instructions will help you get the financing you need. If you are a start-up seeking a commercial loan, BoeFly provides you answers to your most important questions for your business. Get the FREE How To Get A Small Business Loan: The Complete Guide To Getting Financial Help eBook now by clicking here. The way we conduct Internet searches has changed recently. And, in the world of the Internet, you’re only as good as the number of clicks you get. If users don’t click on your site/offer, then the opportunity is lost. So, what’s an effective strategy to gain clicks? Let me introduce you to rich snippets. It kinda sounds like a delicious new cracker, but it’s really something much, much better than that. Rich snippets are part of what is called a semantic search. Semantic searches deliver detailed listings we never saw before. They do this through predictive technologies from search engines. Semantic searches or rich snippets enable a new and better way to display products and services by including ratings, reviews, availability, price, and much more. Enhanced search results means your site has been awarded a rich snippet by the search engine. Users are more inclined to respond to search results that have additional information, images, and colors. Rich snippets are your way to embellish your search results with additional information geared toward attracting users. Rich snippets are your way to break through the clutter, get noticed, and increase your clicks. When you do a search, a list of results pop up on your screen. Snippets are the lines of text that you see at the end of each search result listing. Snippets provide additional information regarding the page’s relevance to the word or phrase that you searched, with the words that match the query shown in bold as shown below. In this example, the snippet is the information in the green box. Ratings, pricing, and availability are commonly seen in e-commerce rich snippets, indicating the “value” of the page relevant to the search word or phrase. This additional information enables users to make more educated click decisions. Including structured data markup in web content helps Google and other search engine algorithms better index and understand the content. Some data can also be used to create and display rich snippets within the search results, including review stars, an aggregate rating value, and vote count, for example. All of these are very useful to anyone searching for information about your product or service. Rich snippets work for all types of e-commerce sites. If you are selling a product or service, and you have a published price, you can make use of rich snippets. The markup code that helps search engines classify the information for rich snippets can be easily inserted into your page templates so that the code appears on every relevant page on the site. Here’s an example of a rich snippet with the cost added. The goal of rich snippets is to improve a user’s search experience by showing only the highest-quality and most relevant results to a search query. This is done by a process called semantic markup. (A tiny bit more on that in a minute.) Whether your product or service is searched on Google or Bing won’t matter because both support all of the rich snippet types most relevant to e-commerce sites. Product – Information about a product, including price, availability, SKU number, and review ratings. Recipe – Recipes that can be displayed in web searches and Recipe View. Recipe rich snippets with photos are widely used in both Google and Bing. They are a highly effective option if your site sells food products or offers unique recipes. Review – A review of an item such as a restaurant, movie, or store. The commonly used properties are Item, Rating, and Count, the last of which identifies the number of reviews submitted. The Reviews markup type also includes the ability to mark up a product photo. Event – An organized event, such as musical concerts or art festivals, that people may attend at a particular time and place. Software Application – Information about a software app, including its URL, review ratings, and price. Bing offers the additional ability to add a photo of the item to your search results. Here’s an example of that. Rich snippets are the next new thing driving the success of e-commerce. Google and Bing both publish detailed information on how to implement semantic markup for rich snippets and offer support. However, your web developer is your best bet here. They can guide you through the process so you make the best use of the available options. Already using rich snippets? What kind of results have you experienced? Please let us know. Specific. What areas do you want to focus on? Number of visits, revenue, product line, content offers, etc. Once you know, you have your specific KPI that needs to be measured. Measurable. Whatever your KPI, it has to be able to be measured. If it cannot be measured, then it’s not a KPI. Assignable. Someone in your organization has to be in charge of monitoring and reporting on your KPI. Realistic. Keep your goals realistic. While SEO is highly effective, it isn’t a magic bullet. I see lots of clients have unrealistic goals. Use historical data and where you want to be to guide your goals. Remember, goals can be achieved in phases. Time-Relevant.Give yourself a deadline to complete your goal. Here’s where you’re going to need to look at your web analytics. Calculating the number of visitors to your site is pretty basic and straightforward. Tracking orders and revenue is a bit trickier. To track revenue, you must enable the ecommerce tracking features in your analytics package. This will enable you to track online orders and sales. This gives you valuable insight into your SEO and what’s working for you. You may use third-party vendors for pay-per-click, affiliate marketing, and e-mail marketing, and they will likely provide their own analytics tools. That’s fine, but make sure you continue to track your KPI in your own web analytics package so you’ll have a good comparison. Let’s take a look at how you can best use your monthly data to create informative reports that track where you are in relation to your goals. Do a comparison for each month over the same month last year, creating separate reports for visits, orders, and revenue. This is smart because it removes seasonality and gives you a real gauge of what you can expect in the coming months for each category. Chart your data out in Excel or your web analytics package so you can easily spot trends for each category. Combine the findings of all three categories into one report to see how they relate to one another. By tracking visits, orders, and revenue data you are better equipped to judge the success of your SEO. What have you done that has successfully impacted your SEO? Share your ideas with us.